Paris is only a stop along the path to the green and peaceful future we all deserve, not the final destination. Twenty-three-year-old Parama Ram is the operator of the solar-powered reverse osmosis plant in Kotri village, Rajasthan. He maintains the photovoltaic panels and operates the plant, which produces over 3000 litres of drinking water per day from the brackish groundwater. Parama is also trained as a barefoot solar engineer: assembling, installing and repairing solar lanterns for villagers who need them. A version of this article was first published in the Huffington Post and is re-posted here with permission. 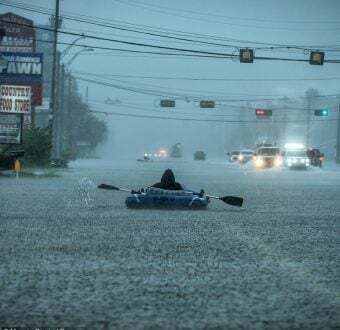 It’s clear: both people and biodiversity already suffer the negative impacts of climate change, whether in the form of unexpected floods in our communities, stronger hurricanes, or changes in habitat for vegetation and wildlife. The ten hottest years on record have all occurred since 1998. The year 2014 currently holds the record, but it’s all but guaranteed that 2015 will soon claim the infamous title. The only question that remains is when will we act? Why do we continue to obtain our energy from non-renewable, dirty sources that only make these problems worse? Our largest energy sources — fossil fuels — are taking us down on a path that will lead to global temperatures far above what our society and economy can bear. And the current rise in temperature averages is already disrupting our lifestyles. This is the gloomy backdrop to the international climate talks in Paris. The world’s leaders are meeting in the French capital to agree on a plan that will, hopefully, keep global warming from further changing the climate and disrupting our lives. So, the big question is: what needs to be done to put us back on track? First of all, we need them to agree on a just transition from oil, gas, coal, and nuclear energy to 100 percent renewable energy sources by 2050. Not only does renewable energy prevent further pollution in the atmosphere, it is inherently safer, cheaper, and accessible to all. This path will provide cleaner air and water and keep temperature increases within the limits that our planet can sustain. According to a recent report from Greenpeace, 100 percent renewable energy for all is both achievable and cost-effective given the right political decisions. 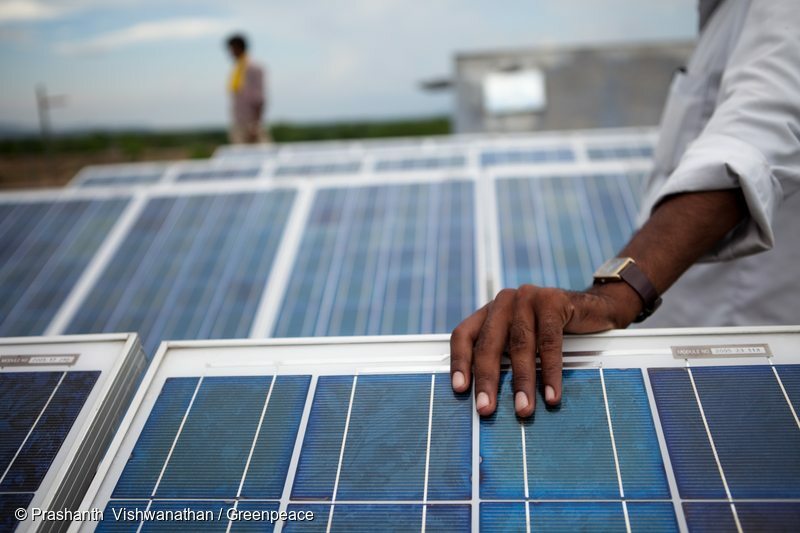 There are signs pointing towards real momentum right now for stepping away from fossil fuels. The U.K. has just announced that will close all coal-fired power plants by 2025. A new OECD deal would cut off financing for 85 percent of coal-fired plants. Shell has stopped its attempts to drill for oil in the Arctic — and is pulling out of a tar sands project in Canada. And in October, President Obama made a historic decision by rejecting the Keystone XL oil pipeline, citing the need to keep fossil fuels in the ground. Ahead of the climate talks in Paris, most countries have submitted their intended contributions to a global climate deal, aiming to accelerate national ambitions on taking action. While those contributions could make a real difference, they are still highly likely to exceed the 2 degrees Celsius global warming limit. That is not only irresponsible regarding the environment, but also a huge social and economic burden and a failure on our moral obligation. Therefore, those pledges should only be seen as a starting point and not the final level of action we’ll see. They need to be reviewed and strengthened in five-year cycles starting right after Paris. And there’s more that can be done. For example, Costa Rica powered itself on 100 percent renewable electricity for the first 75 days of 2015. Tech giants like Amazon, Google and Facebook, all have laid out road maps that explain how they intend to achieve procurement of 100 percent renewable energy. The solutions are already there, we just have to make use of them. 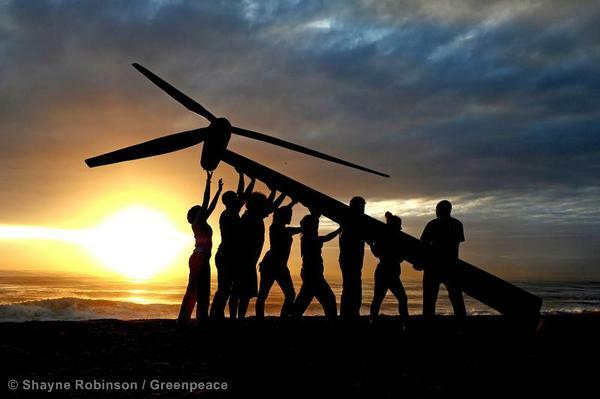 Raising a wind turbine in Durban, South Africa. Since most of us won’t have the chance to actually negotiate a deal in Paris, you may be asking yourself: what can I do? 1. Instead of focusing on producing more energy, let’s save energy by implementing the most energy efficient devices existing today and switching off unused equipment. 2. Let’s push the transition to renewable energy sources by changing our energy supplier or even installing solar panels on our rooftops, investing in wind energy, raising awareness via social media or telling our friends of the benefits of renewable energy. 3. Let’s put pressure on our local governments. In India, petitioners have just taken to the Supreme Court in an effort to reduce emissions and boost air quality. We can all make a difference! 4. Show leadership in taking climate action by organizing marches, festivals, showing banners, and signing petitions or creating your own. Get creative! When your efforts result in a transition from dirty fuels to renewable energy, our air (and conscious) will be cleaner, money will be spent sustainably, and we’ll create more jobs in the green sector. The climate talks in Paris could be a milestone by providing all of us with valuable, long-term direction to begin a journey that will continue until we achieve 100 percent renewable energy for all in a just transition that leaves no one behind. Let’s take responsibility for the world we’re living in, for those most affected by the impacts of climate change, and for future generations. Paris is only a stop along the path to a 100 percent renewable future, not the final destination. Martin Kaiser is the head of climate politics at Greenpeace International.